I brought my entire stash of batik fabrics with me. I don't have many. Mainly the ones I have left over from making my house table runners. Using Karen Neary's Maritime Beauty pattern, I'm going to make a Beauty out of these batiks. I have all the pieces cut out and the papers ready to paper piece the points. BUT, I have no light background fabric that will be used behind the spokes. Eek... I guess I better go fabric shopping on Monday. Do you want to see my prototype Maritime Beauty that I completed last summer? I made this one out of old scrappy fabric because I signed up for the class at the last minute. I love how this scrappy beauty turned out and it stays at the cottage. I can't wait to see it again in April or May. Check back in a couple of weeks, and I'll show you the the completed beauty top. I'll just machine quilt it when I get home. My sinus problem is clearing up and I'm itchy to sew. In between Olympic games, I'm pawing through my mini-stash that I brought with me. I finally decide to open the Lemoyne Star kit that I brought with me. I've been dragging that box around for 3 years now. As I start to drag out the rhombus pieces, and the triangles and squares, every inch of me wants to close the box. But it's time to get into it. I now realize why I didn't want to start it. Those darn "Y" seams. I hate them. I lost hours of thinking time on the church quilt I did in January. I was trying to re-think the pattern to avoid a dozen small Y seams. If I had a just got to it, I would have had them done in less than an hour. So, I resist the urge to close up this boxed kit and commit to myself to at least do a few blocks. That's all I needed and I'm into it now. I'm following the directions very carefully. I have the first block almost finished. It's in two parts. I don't have the courage to sew them together today, but I will tomorrow. I'm hoping to have all 16 blocks done by next Friday. If I can do that, then the rest will be a breeze to put together at a later time. Stay tuned next Friday. I'll let you know if I get them done or not! Hey there Friday Girls. Have a great Coffee Break. I miss you all!! I've really enjoyed my stitching efforts this second week of stitching. I can't believe how easy my monochrome color scheme is. Since the color choices are limited, not a lot of time is spent deciding on thread colors to use. When I want a change, I stitch with a bit of silk ribbon. I have about half the seams covered on the three socks. I'm hoping by next week all the seams will be covered and I'll have lots of silk ribbon done. I may even start adding a few beads next week. We'll see. Do you see the little buttons that I added? I love those. I only added these three to see what they would look like but I will add more to the other socks this week. In the past couple of days, I've been looking at numerous online fabric stores. I've been looking for a fabric collection by Moda called Figgy Pudding. Well, it just so happens that I was in TJ Max yesterday and with figgy pudding being on my mind, I came across this deluxe professional pudding steamer in the discount aisle. 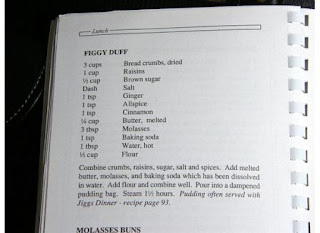 When I was at a quilt conference in Newfoundland in 2008, one of the local deserts they served us was a delicious moist cake -like pudding called Figgy Duff. It was deliciously spicy and tasted somewhat like a Christmas desert. After the conference we did a bit of touring around Newfoundland in the Trinity and Bonavista areas and stayed at a couple of bed and breakfasts. At one of these BnB's, the kitchen counter was lined with well used cookbooks, so I took the liberty to flip through the pages of one of these books and look what I found. A local recipe for Figgy Duff. I have the recipe, and I have the special pudding steamer. So now when I get home in the spring I'm going to make this and have my niece, Michelle and her new husband Scott over for a nice Sunday supper. I'll serve Figgy Duff for desert since Scott has some Newfie roots and likes Figgy pudding. Actually, now that I think of it, he was going to get me his secret family recipe for Figgy Duff. I must remind him. Do you have a favorite recipe for Figgy Pudding? Last week, I was featured on the Lazy Girl Designs blog. Well, this week, Joan has featured the work of my sister who lives in Nova Scotia. Joan refers to us as Lazy Sisters. Isn't that cute. Donna has done something that I've never done, but I think I will give it a try when I get home. She personalized the Lazy Girl Take-Along bags with embroidery. They are really nice and would make a perfectly unique gift. Go have a visit and be sure to leave a comment on the Lazy Girl Blog. On cool and windy days, we take an "off the beach" walk and we have a couple of routes that we take to get our 50 minutes in. I always stop and admire this bush when we walk by. I know I showed this last year, but a whole hedge of holly in darn impressive. This year, the holly is full of berries. I should have been out last week when it was snowing, just to get a picture of the holly with snow on it. I missed the opportunity. It hasn't snowed here in 11 years, and heaven knows when it will snow again. When it does, I'll be a little more prepared to run out and take a picture. The hedge is so tall that I can't even see the house that is behind it. I thought, if I see somebody there, I would ask if I could come and snip some branches for a decoration to enjoy at the condo. But we never saw anyone. This is a great segway into the pattern that I've chosen to buy fabric online for. I have admired this pattern online and have seen it in a few places. I decided for my little experiment, to make a Christmasy quilt. I spent what seems like hours looking at patterns in online shops and I found a few that I really liked. The problem I found out is that project requirements are not given when you want to buy a pattern and fabric online. So once I realized that, I went looking for a free pattern that would have the fabric requirements for me. I found this "Free Pattern" page at Aunt Bea's Fabric store helpful and I came across this free pattern by Moda - designed for their Figgy Pudding line of fabrics. I have seen this fabric featured on the bakeshop website. It has caught my eye before. I also saw this pattern made recently a light blue background. It happened to be on the wall in the background of a video tutorial by the Missouri Quilt Co. Don't get distracted by the table runner demonstration. Just look at the back wall. :) I love these cool wintery colors of the sample shown on the wall in the video. Sew, my online fabric search began. I've spent more than a few hours in some online fabric shops. At first I was going to try to pick my own similar colors out and do it like the Missouri Quilt Co., but after a few attempts at working the online carts, color matching etc, I decided that I would just buy the Moda Figgy Pudding fabrics that are shown in the Free Moda pattern that you can find here. And the search continues and more problems. 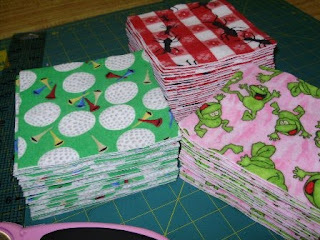 It's hard to find a quilt shop that has the entire collection or even half the collection of fabrics, so now I'm looking for a shop that at least the 4 or 5 main figgy fabrics, with trees, with swirls and with presents. I'll get the solids as close as I can. That's not easy to find either. I had a bright thought that I'd try eBay. There is a dealer there that has 4 of the fabrics but she sells them in 1 yard cuts. I need only 1/3 yard cuts. I may work up the nerve to contact her to see if she will sell me small cuts. So I'm slowly coming to the decision that buying fabric online is not as easy as it seams. If you are looking for a small number of fabrics, it's probably easier. If you are looking for beautiful batiks to build your stash, it's probably easier. It'll take me a little more time to buy the fabric for this project. I may end up looking for another pattern with fewer fabric choices. Tomorrow, a figgy find that is not fabric related. Stay tuned. I have never shopped online for fabrics before, have you? Since I live in Canada most of the time, shopping from US online stores can be prohibitive because of international shipping. So, while I'm snowbirding in the US, I thought I'd give it a try. To get the most from your shipping dollar, you should try to buy between 7 and 9 yards of fabric. Most stores have a clearance section. If you don't want to spend any money on shipping, if you order over $50 some online stores don't charge you shipping. I found one highly recommended will ship free for over purchases over $35. Get a couple of references as to service, quality of fabrics and promptness. I have references from an online board that I look at every day. Not all online stores carry everything in the way of notions and threads. I'm looking for non-nylon invisible thread, and that is a problem. So, I am going to pick out a pattern on the internet and buy the fabric online as a little experiment. I'm not sure what else I should look for in an online dealer, but I'm quite excited to do this little experiment. I'll let you know about my decision as to dealer, pattern, fabrics on Sunday, after I place the order. It'll be interesting to see when it will arrive. I hear that it only takes 2 or 3 days to get an order. We'll see. I brought 3 pieced crazy Quilt foundations with me. I'm hoping to get lots of stitching done so that I'll have a really good head start to have these done before Christmas this year. So, this week, aside from getting started which can be a hurdle for me, I have applied some lace trims to each of the socks, and and I've started to do some basic stitching. I had to look at my notes and books again for a little refresher on how to stitch the blanket stitch. As you can tell, These are going to be very monochromatic socks compared to my last three socks that were very pink. The white, cream and taupes are very classic and will look nice when hung together on the mantel. I may add a bit of color when I do the beading, buttons and other embellishments. I was brave and cut into a doily to use as the heel on two of the socks. The other sock will have some lace placed in a curve to suggest a heel. In the past I have followed the regimen to stitch with flosses first, then do silk ribbon, then bead and embellish. This time, I'm definitely going to do flosses and ribbons interchangeably. I may even decide to put some beads on before the end. But my first two or three weeks will be concentrating on covering most the seams with at least basic stitches. I am featured on Lazy Girl Designs! Have a look at the Lazy Girl Designs website. 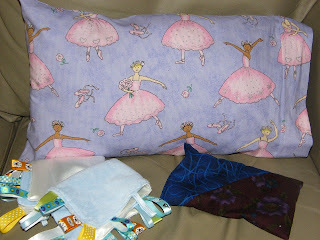 You probably already know I love the Lazy Girl designs by Joan Hawley. This week, Joan has featured ME on her weekly blog. Go have a look at the Lazy Girl's blog. Be sure to leave a comment, ok!! So you might ask, what is my next Lazy Girl project? Here it is. 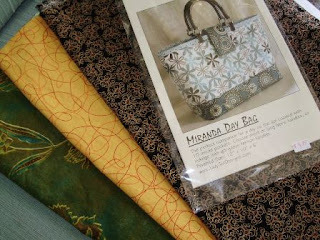 It's a Miranda Day Bag. These are the fabrics I'm going to use for my first go at this bag. I need a couple of things yet before I can get started, but I should be all set to start this bag next week. I'll be sure to show you my progress. 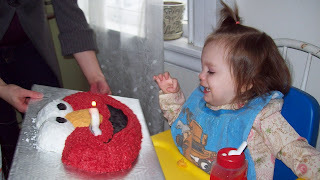 An Elmo Cake for Baby Aurora. 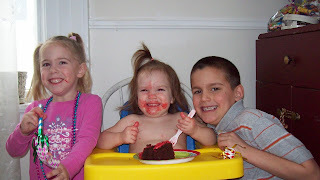 Here's a picture of Aurora when she saw her Elmo cake that her Mama made for her last week. And what's a birthday without friends. 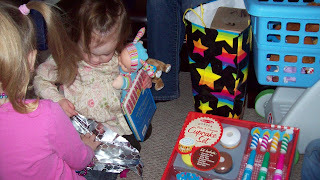 And presents from friends is so fun when you are 2 years old. Good job on the cake Mama, and Happy Second Birthday Aurora! 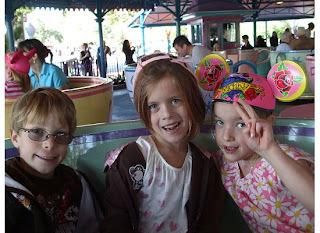 Remember a couple of weeks ago, the triplets went to Disney for their 8th Birthday. Here are a couple of pictures. It looks like they had a blast. It snowed ever so gently overnight. It was very white out when we got up this morning. But the sun came up and the snow was all melted by noon. I knew it all along. 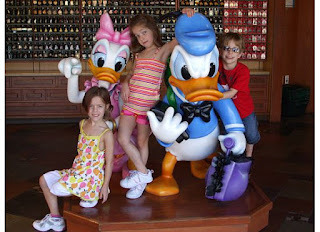 I am a Lucky Duck! I recently found out that I won prizes on 2 different blog draws. The first is a Stitching blog that I regularly read. SRE Deluxe. She was having her 2 year blogaversary, and I was drawn as one of two lucky winners. I haven't seen what it is that I won yet, but I think it's going to be one of her own patterns for a beaded creation. I can't wait to see it. The second win is from an eco friendly tip that I submitted on the Quilters Connection blog. I was chosen randomly and the prize is a fun Eco friendly gift package that includes a selection of eco-friendly fabric from Cloud 9 fabrics, Mary Ellen's Best Press, Sew Karen-ly Patterns, Quilter's Dream Green batting, Natural twill from Pink Panda fabrics. Thanks very much to all the suppliers. I can't wait to try all these products. Snow's coming. It's everywhere in the south. It's overshadowing the Olympic start today. They say that this is the first time in modern history that snow will hit all the states in the same year. This is a picture of the beach from our condo balcony. It's not that cold, but there's not a person walking the beach. The water is very calm. So for my technology friends, can you spot my wireless connection at the condo in this upper picture. Scroll down if you want me to show you where it is. If you can't spot it, look at this picture. Lower Left. You can see the white access point with the antenna. It's mounted on the post of the little walkway bridge that leads us to the water. I love it that we have wireless at the beach. There is a very nice winter themed, online hand stitching exhibit here. My stitching friend Judy G. has a beautiful entry. I love the subtle sparkle of the snow and the amazing stitching of the beaded tree. The exhibition doesn't show alot of detail, but here are some higher resolution pictures. Don't you think it's very nice. Be sure to have a look also at the link above, and give a vote for Judy G. on the sidebar of the exhibition. I am getting into the swing of things on Day 2 at the beach condo. It's a beautiful sunny day, and a little cool. Our daily walks along the beach will probably be a little lazier than our normal power walks at the Willie Orena. But who cares. As long as we're moving, right!! I am participating in an I Spy Flannel swap on an online quilting board. "I spy" flannels out of quilters flannel are harder to find than I thought. I did finally get 3 fabrics. Golf balls, picnic ants, and frogs. They're cute. I got my 3 flannels washed, pressed and cut. Now I need to find an envelope to mail them in. Because they are flannel, they take up more space than I had planned on so the search is on for a perfectly sized envelope. I will get my swapped blocks back about mid April. I don't know who this quilt will be for, but I thought doing a flannel quilt was such a different idea. We're closely watching all the snow in Washington. I'm so glad the snow is not coming up the eastern seaboard. It looks like the storm in heading right out to the ocean. So, we're adjusting our plans and going to take our time heading out tomorrow. We're not going to drive that far tomorrow, maybe to Portland, Maine and then evaluate how far we go on Monday. I'm glad we're taking the "Inside route", as the snowbirds call it. That way we stay away from New York and Washington. We're hoping that the snow will have melted by late Monday when we by pass the hard hit areas start heading towards Richmond where we'll catch the I95. I am getting a kick out of looking at some of the photos online. My stitching friend Judy send me this link. Photo number 1 is a poor Domino's Pizza guy stuck in the snow. Do they still have that 30 minute pizza delivery guarantee? And further on, people on bicycles should not take them out in a snowstorm! I guess that we folks, who have regular snow, and lots of it, should be thankful that we have the equipment to handle the snow and the experience to manage it. I'm off to have coffee with the Friday Girls this morning. It'll be the last coffee I have with them for a couple of months. I'll miss my social Fridays while away. Weather looks good for the next few days, so final packing is well underway. 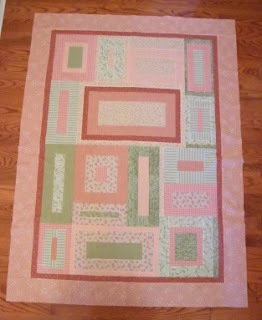 The baby quilt that I showed you yesterday has been finished until the news of the arrival of the baby. The sewing machine is now unplugged and ready for travel. A baby quilt finally has a baby to cuddle. Early in the week I went to visit a young soon-to-be mom. I used to be good friends with her aunt who took her in over 20 years ago, when she had lost her dad, and her mom suffered in a hospital with illness. So I knew this young girl when she was about the age of my older grand children. And I lost touch over the years with her and my friend when we moved. Shes now living on her own, and in university. The minute I saw her, and her familiar smile, she said, "I remember going to your house, and doing crafts in your sewing room ". I really don't remember her coming over that often, but she does. She looked the same, just all grown up. It was so nice to see her. I made her some bibs, taggie blankets, a ribbony baby ladybug and some receiving blankets. I took her the Baby Take Along bag that I showed you recently here. It was filled with things she might need in the hospital. As well, I brough t her some things from Patience and things that I no longer need around since Baby Aurora is no longer a baby. This young Mom to be was so pleased, she said "You made all this for me!! Oh, Thank You, Thank You!" I was so touched by her appreciativeness and as we said our good byes, I thought to myself, that's it, I have to make her a baby quilt. She's such a nice young lady and her boyfriend seems nice too. She doesn't have anyone close to her who is a quilter. So, that's going to be my job. I'll make a nice baby quilt for her. Of course, this week, I said to myself, that I wouldn't start anything new. In my mind, I said, I sure I have a UFO of some sort..So in thinking in terms of of baby quilts, last year I was on a mission to make 3 of these Nancy Halvorson baby quilts. I found out, that after having half of the blocks done for the 3 quilts, 2 of the 3 babies that I was intending to make the quilt for, turned out to be boys. 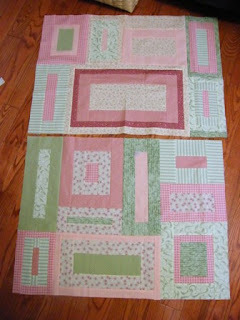 I quickly lost my enthusiasm to make these quilts although I love the pattern. After all this, I had intended to just use the blocks and put them together to make Aurora a twin size quilt, but I have something else in mind for her single bed now. The blocks, fabric, pattern sat in a pizza box... now a UFO. Yesterday, I took out the blocks and sorted out what I had done, and what was left to do. It took considerable effort to sort through my papers, notes, fabric strips, blocks (all times 3) and find out where I had left off. I did get blocks sorted and I have almost finished the center of the quilt. The name goes in the larger block that has the darker outline'. Since I don't know this precious baby girls name, I'll wait and applique her name on when she is born in early April. The minute I hear, I'll be ready to swing into action and it won't take long to applique her name, layer, machine quilt and bind. So, one of these baby quilts finally has a baby that it will snuggle soon. This week, we'll be packing to head south for a couple of months. I'm taking some crazy quilting hand work to do while we're away, but I'm also taking my old sewing machine. Its hard deciding what sewing project(s) I should take with me. I have a kit of fabric for a queen size quilt all ready cut and in a pizza box. 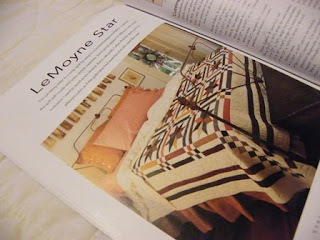 It's for a LeMoyne Star from an older book by Marsha McCloskey, I brought that kit with us last year and didn't do it. I'm wondering if I should bring it again. For a smaller project, I have the papers photocopied to paper piece a round table runner by Karen Neary. It's her Maritime Beauty pattern. I have left over batik fabrics from my house table runner that I plan to use them to make a Batik Beauty. I made this Beauty in Karen's class last spring and it's now at the cottage. It was my "prototype" and I really like it but now I do want to do a good one. So, I'm thinking, thinking and thinking about what other sewing project I should bring with me. While I'm in my room thinking and cleaning up, I've been sewing small stuff. Today I made a small pillowcase for a small pillow that has been kicking around my sewing room for a while now. I'll bring it to Aurora this weekend. Patience needed a couple of boy taggie blankets for a new baby coming soon, so they didn't take long to whip up. And lastly, I made a 5" by 7" bean bag. This will be used on the console of our car to hold the gps during our travels.